Home › Health & Fitness › Types of Training by Mark Morgan. This is the second in a series of columns designed to help you swim at your best at meets, or just better appreciate your swimming experience. Countless words have been written over the years about the different types of training and sets that swimmers can or should do to achieve optimal performance. We have read reference to the physiological and biochemical justification for each type or set and the energy system(s) allegedly being used. Aerobic, anaerobic threshold, lactate tolerance, high velocity overload, now ultra short race pace. And monitoring which form of training a swimmer is doing using heart rates, lactic acid production, perceived level of exertion…. the lists go on. Confused? How does a swimmer know what type or combinations of types to use for their best event(s), especially as what is supposedly scientifically proven as being appropriate has changed over the years and training types and their monitoring methods go in and out of vogue. As a coach at the elite level I always struggled with how to determine whether any swimmer, let alone a group, was doing a set as required or using the desired ‘energy system’ in any given set, given all the potential variables. And how does one scientifically prove a certain program, type of training or set is the best for any individual, group or race distance anyway considering all these potential variables? Nevertheless much progress has been made in terms of specificity of training for different individuals or distances, especially from the days where virtually everyone trained like a distance swimmer and high volume and short rest were the principal preoccupations for coaches. And this is all without considering technique and skill-based training, which will be addressed in a subsequent column. I don’t think it all needs to be so complicated, especially for most Masters swimmers, whose age and accompanying changes in physiology, biochemistry, capacity, recovery time (amongst other things) no doubt mean that many of the complex considerations for the elite swimmer do not apply or are less relevant in ways I’m sure I don’t fully understand. • All swimming events apart from 50 metre events require significant levels of basic aerobic endurance, with increasing levels the longer the race distance. • While aerobic training was no doubt overemphasised in the past, I still believe it is an important ingredient of training for most events, and, in the sort of overreaction that occurs in many areas of life, is now perhaps sometimes neglected for swimmers whose best events would be, say, 1500 freestyle, 200 butterfly or 400 individual medley but who happily drift along trying to take the supposedly ‘easier’ path of being a (usually mediocre) sprinter. • Aerobic sets include longer continuous swims; sets of longer distances (e.g. 400s); or sets of any distance on shorter, decreasing or short rest time cycles. • I am no exercise physiologist, but I understand that as one ages it is easier to maintain and develop aerobic capacity than anaerobic capacity (loosely, ‘speed’). • Aerobic training does not necessarily need to be done at high speed or heart rate. • It is easier to initiate and practise technique and skill elements/changes at aerobic speeds. • Aerobic swimming seems to have the most beneficial effects on mind, body, health and wellbeing, which hopefully even for successful Masters swimmers are still the primary motivation for swimming. • It’s anecdotal evidence I know, but towards the end of my elite career and into my Masters career, I maintained a high level of race performance, and even swum PBs over 50 and 100 metres, by doing little other than aerobic swimming (often just a straight 1500 on my own at increasing speed). And I have seen many other swimmers swim fast over all distances purely on aerobic training. • Obviously any swimmer needs to do at least some training at the speeds of their race distances, and practise the appropriate pacing. • Under this heading I include all sets where pace or quality is emphasised, apart from speed and short sprints (see below). • I intend to cover ‘race pace’ (including ultra short race pace training) in more detail in a later blog, so will do no more than use the term here. • Quality sets include sets with moderate, increasing or longer rest time cycles where the swimmer tries to maintain the fastest possible average time throughout the set or descend times (i.e. makes each repetition faster than the previous one); sets on long rest time cycles swimming each repetition at maximum effort or doing one easy repetition followed by one at maximum effort; and any other sets practicing race pace (see above). • It is important at least for those who swim 50 metre races (and the ludicrous 25s now offered at some meets) to practise swimming at absolute maximum speed. • This type of training can really only be done over 25 and possibly 50 metres, and with a set length and on a time cycle that allows the swimmer to recover sufficiently to be able to swim at maximum speed. • I am inclined, without hard evidence, to think that this type of training has a particular significance for Masters swimmers, because as we age we seem to gradually lose the ability to move limbs and muscles as quickly as is required for short distances, so there is a need for some neurological/muscle recruitment practice to remind the body how to move fast. 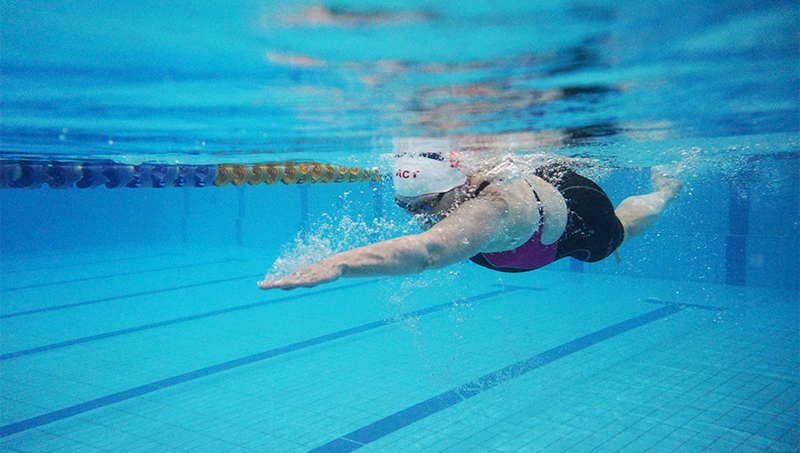 What combinations of types of training you do IS important for your swimming performance, as is honing your swimming skills, but – call me old-fashioned – one of the most significant factors is still simply how many laps you do. So if nothing else get in and swim, swim for life!